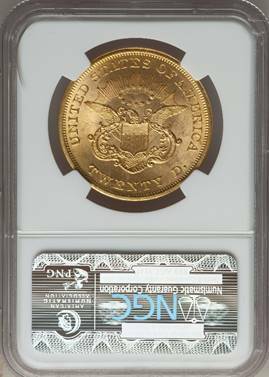 The 1865 Liberty twenty claims a nominal mintage of 351,175 pieces. Before the era of recent shipwreck finds, the 1865 double eagle was seldom encountered above the VF-XF grade level. Fortunately, 320 examples of the 1865 were recovered from the wreck of the S.S. Republic. 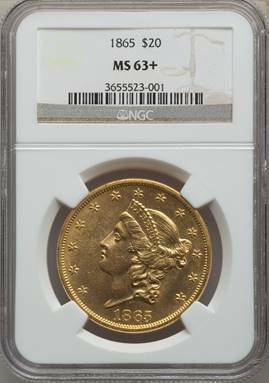 Most of the recovered coins were in higher AU- Mint state grades, all the way up to MS65. The one offered here is clean and satiny in its appearance. In MS63, listed $23,500 in Trends.